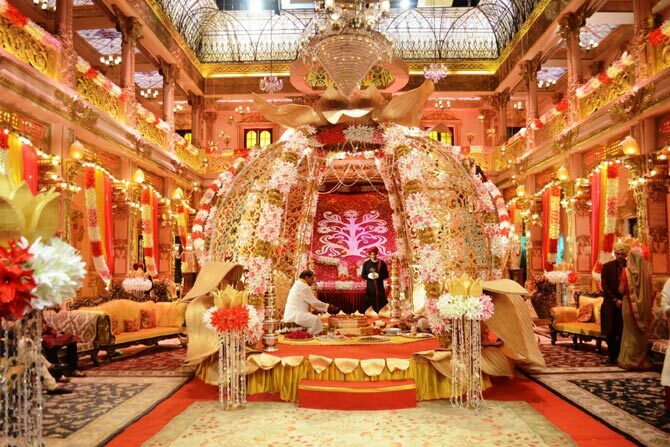 Rediff.com » Movies » Is this TV's wedding of the year? Is this TV's wedding of the year? A wedding fit for royals, this. 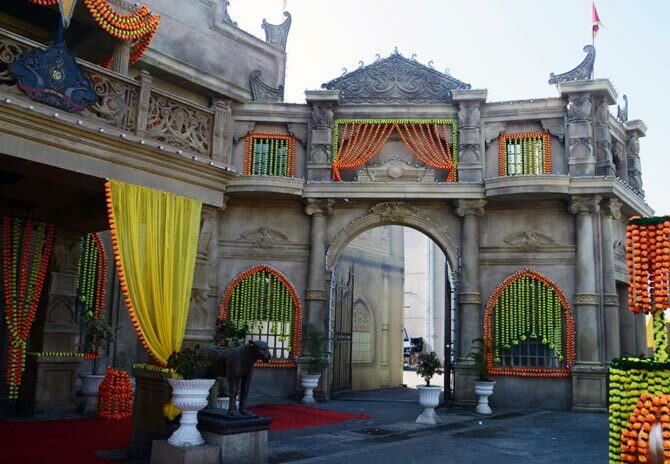 Zee TV's new show Ek Tha Raja Ek Thi Rani is about to telecast its protagonist's wedding ceremony. And it promises to be all kinds of opulent and epic. Drashti Dhami, who plays the female lead Gayatri in the show, is all set to marry the prince, Rana Indravardhan Deo (played by Siddhant Karnick), in a royal wedding to be telecast on Saturday, September 12. The insides of the royal palace in the show are really opulent. Gayatri and the prince, in a still from the said episode. 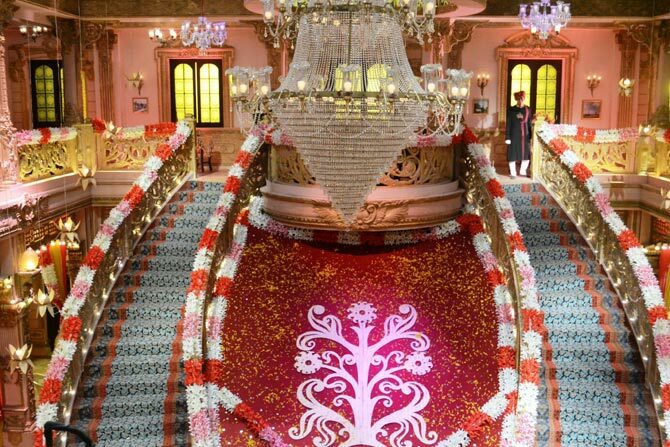 Here's another majestic shot of the staircase adorned with festive flowers and magnificent chandeliers. Dhami, who got married this February, is only a little bit enthused about her impending onscreen nuptials. "Real life weddings are different. Right now, I am only trying to figure out what to wear, about the hairdo and the make up. It’s very chaotic and everyone is very excited on the set. "Only similarity between a real and reel wedding is that everyone is excited, but while it was more emotional in real life for me, this is all work-related excitement, the actress explains. Here's the queen, played by Anita Raj, watching over her son as he extends his hand to put sindoor on his bride. Interestingly, Karnick, who is single in real life, has shot two other wedding sequences in the past on different shows. "The advantage of being an actor is that we get to live out milestones through the characters we play. In this case, I got to dress like a prince, a bridegroom, it's a wish already fulfilled (on TV). So I am in no hurry (to settle down). "But whenever I get married, it won't be on such a grand scale. I would like it to be intimate, just with close friends and family," he adds. Drashti, who is also in favour of a small, intimate wedding, was admittedly denied the luxury since she was the last girl to get married in her mother's family. "So we had to invite everyone," she says, adding that she would've liked to have an informal beach wedding. "I'll probably plan one for our fifth or tenth anniversary," she says. And finally, here's the extravagantly decorated exteriors of the palace.